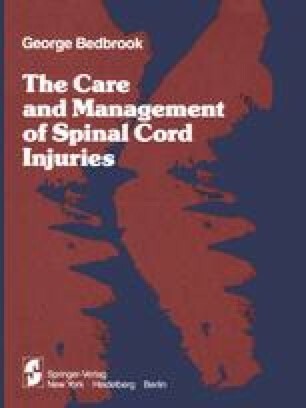 As part of the conjugate team associated with the management of spinal cord injuries, the physical therapist (whether he/she be a physiotherapist or an occupational therapist) must be well informed as to the cause of the paralysis with all its pathologic significance and prognosis. In fact, every aspect of the patient’s physical condition must be made clear. It is important that he amalgamate his personal knowledge with sound medical and physiologic grounding so that the application of his science has meaning. During the early stages of management he is responsible for the acute management of respiration, passive movements, the introduction of independent movement to the patient, and subsequently, the reeducation of nonaffected muscles. This management is helped enormously by a clear understanding and appreciation of the patient’s preaccident activities.